Therapy dog Bruno leaves behind a comforting legacy. 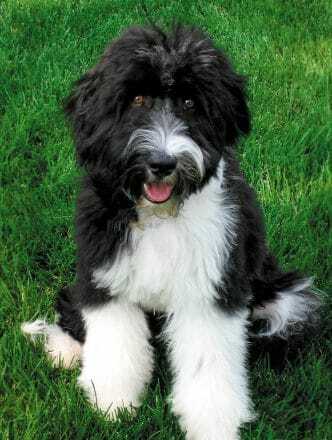 For 12 years, Bruno, a hypoallergenic Portuguese Water Dog, made the rounds with his master Dr. Leo Eisenberg at the DNS Oncology Hematology Clinic at Huron Valley Hospital in Novi. In fact, many of his patients said they would only undergo tests or chemotherapy if Bruno was there, too. Sadly, Bruno, who Leo gave to his wife, Mira Eisenberg, as a pup for a 60th birthday present, died at age 14 in early February while the couple, now retired, were visiting with friends in Palm Springs Desert, Calif.
“We are so deeply saddened by his passing because he provided so much comfort to every patient he came in contact with,” said Mira, who worked at the Novi clinic with her husband. Early on, the Eisenbergs did not want to leave Bruno home all day while they worked. They decided his gentle disposition might be beneficial for their patients. Within six months of a year-long training accreditation course from Alternative Canine Training, Bruno became the area’s first canine trained to relieve stress and anxiety for patients confronting life-threatening illnesses. In his life, he sat by the sides of hundreds of cancer patients. With his furry paws and soft brown eyes, he could distract them from pain and anxiety while they were undergoing treatments and tests. After Bruno had been giving comfort to cancer patients at Huron Valley, the chief of medicine at Henry Ford Hospital in West Bloomfield caught on to the benefits Leo was seeing in his practice. In 2009, Henry Ford also started using canines for easing stress and anxiety in their patients. According to medical officials there, studies have shown that interacting dogs can increase levels of oxytocin both in the animal and the human petting it, which can increase happiness and can expedite the growth of new cells. A JN story featuring the Eisenbergs and Bruno from June 28, 2007, explained how Bruno was helping brighten the outlook of cancer patients. Training to be a hospital dog means dogs like Bruno cannot eat anything off the floor or beg for food or attention. They also need to focus on human social cues to determine whether a human wants attention. Mira remembered one brain tumor patient who was very depressed. After four days of not eating and sleeping most of the time, he perked up with some TLC and encouragement from Bruno as he lay in the hospital bed at the patient’s side.